GRASPING AT STRAWS for Kingston waterfront promotion. HOW TO RUN A RAILROAD. All aboard! The Lake Ontario Park express. First you have a public meeting and THEN you post proposal details online. This guarantees minimum buzz prior to the meeting, a low turnout, and uninformed attendees at the meeting itself. All the better to ram-through pre-conceived plans with a minimum disruption like actual input. This is how the people who have fucked-up our waterfront operate. Related: The City's token 4-question online LOP survey from last January. The QUEEN'S PERFORMING ARTS CENTRE DESIGN was unveiled earlier this week. According to The Whig, it's quite something. A thoughtful reader points out that plans are unclear about its waterfront aspects. The waterfront here has long been a neighborhood and community park for the launch of kayaks, swimmers, windsurfers and scuba divers both east and west of the Stella Buck Building. Now this area is controlled by Queen's. Here's hoping this doesn't turn into yet another loss of accessibility to the residents of Kingston. Considering the number of CFB Kingston Scuba Club blog posts tagged with 'Tett Centre', this site is used 12-months a year, day or night, and it's evidently one of the nicer shore dive locations in the Kingston region. Wouldn't it be great to see active waterfront accessibility built-into the project? ON TUESDAY'S COUNCIL AGENDA is the City Marinas Sustainable Strategy and Business Plan whose weeks-delayed public release was thoroughly botched last month following its truly bizarre August 2006 inception as a suspiciously narrowly-circulated RFI. FINALLY, for perhaps the first time in the seemingly endless Harvey Rosen era, Kingston waterfront takes a step that's NOT downright stupid, or ridiculously over-hyped, or shamefully stalled, or dirigiste, or laughably incomplete, or botched, or totally wasted, or commandeered by a raving bo-bo or otherwise seriously retrograde. THAT the recommendation for the relocation of the Coast Guard at Portsmouth Olympic Harbour be exempted from the above clauses, and that it be referred back to staff for review and reconsideration in light of the community concerns raised within correspondence and through a delegation to the Committee on behalf of the Portsmouth Villagers Community Association. Related: Anne Milina Outlook Point, the waterfront park that stands to be clobbered by said Coast Guard relocation. LAKE ONTARIO SPRING WATER LEVELS are looking good after a winter with lots of precipitation in the Great Lakes Basin. That's good because last November's forecast was bleak. The latest forecasts are a full-foot above that. If water levels matter to you, don't miss the International St. Lawrence River Board of Control public teleconference tomorrow (Tuesday) between 7:00-8:30 pm. INFORMATION KIT from SPLASH, or "Sustainable Practices Leave A Sustainable Heritage", the group that seeks to reset Kingston about, among other things, the annual Poker Run. More background on this here and there's a Facebook group you can and should join in support. 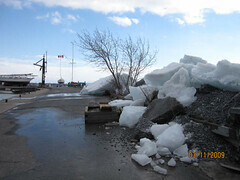 BIG BREEZE TODAY was the tipping point for ice-breakup in Kingston Harbour. See these photos courtesy of Frances O'Neill of ice floes pushed-up on the shore at KYC. Look closely: the ice pushed-up a large part of the rocky beach. UPDATE: See also these photos from Chris Walmsley, also taken at KYC, including this one of the ice crumpling an iron fence. The photos also show yesterday's wind graph which peaks at 100 KM/H (60 MPH on the graph). UPDATE: All this is reminiscent of this scene on February 17 2006, only this year is worse because thick ice floes are far more damaging than water. Peak wind on that day was 84 KM/H. ANNE MILINA OUTLOOK POINT is the newest and possibly tinyest of Kingston's waterfront parks. It sits on the southeastern edge of Portsmouth Olympic Harbour on land formerly controlled by Corrections Canada. It was opened in June 2008. The recently released consultant's report, titled Kingston Marinas Sustainability and Development Strategy and Business Plan says this about the the Coast Guard building that sits on the Western edge of the POH property. Current Coast Guard building inadequate for their needs considering relocation to east side of harbour at Hadders (sic) Bay Park. Recommendation POH7 : Collaborate with the Coast Guard to develop and implement a plan for relocating and enlarging their land-based facilities and berth, while relocating Hatters Bay Park to current Coast Guard location at southwest corner of site. Financial Implications: Minimal or no cost to City of Kingston. Understandably, clobbering a beautiful waterfront park and moving it to a concrete-surrounded petrol-station-sign-dominated place in the shadow of tall condo buildings has folks in Portsmouth Village a little disturbed. But more to the point, according to the consultant, all this is supposed to happen at minimal or no cost to City of Kingston. demolish a smaller but still house-sized structure, and rip-up the extisting Coast Guard area and turn that into a "park". It's a really stupid idea on so many levels. Still, it's out-there, floating-around as someone's bright idea for our waterfront. Nevermind that there's no other publicly accessible waterfront between there and Breakwater Park, a full 1.2 kilometers to the east, as the crow flies. GROUP LOBBIES COUNCIL TO CANCEL POKER RUN from last Thursday's edition of Kingston EMC. The Poker Run is obnoxious, and its promoter is full-of-himself. Read the whole thing. Yeah, we know, it's all about money. Now please take your freakshow elsewhere. PRESERVE OUR WRECKS' Spring newsletter is out. NORTH BLOCK CONCEPT SKETCHES have been posted over at KCAL. These are larger and more accessible and comparable than the buried, popup-obfuscated ones posted by the City. This city only seems to have "vision", for what that's worth, if it involves the downtown and, specifically, land owners who shilled and shelled for the mayor at the last election. Meanwhile, another summer approaches with zero apparent progress on waterfront accessibility, no reversal of the unmistakable trend. ENVIRONMENTAL ASSESSMENT LAUNCHED FOR THE THIRD CROSSING of the Cataraqui River. NATHAN BARON is back ashore in Miami after finishing a 1000-mile solo sail from Miami around the Bahamas, and back. PAUL WASH has just posted a photo sequence of the lifting and installation of the blades and hub assembly on a Siemens wind turbine on Wolfe Island. As Paul suggests, in Flickr click the "all sizes" icon and view the largest versions available.